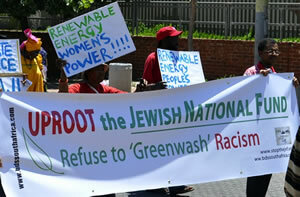 With COP17, the United Nations Climate Change Conference, taking place in South Africa we’ve been approached by several environmental justice organizations regarding the Jewish National Fund (JNF) and its presence at COP17. The JNF potrays itself as a “green” organisation but at the same time it is involved in human rights abuses against the Palestinian people – including house demolitions and forced removals. Furthermore, the JNF administers 13% of Israeli land (which it bans Palestinians from using) and jointly (with the Israeli Land Authority, an Israeli government body) administers another 80%. Israeli land policies are discriminatory and the JNF is intimately involved (and complicit) in maintaining and administering these policies. Attached are two brief pamphlets on the JNF. Strength to our friends in the environmental justice community who will be in Durban this week!